100% Pure and Chemical Free Shakar from Charsadda Region. The name Grans is a Pashto word meaning beloved. The philosophy behind this name is that if you love your family, you will feed them good food. So if you are looking for some pure and organic products, then let us introduce you to Grans. Hunana and Mansoor (the people behind Grans) realised that there is a need for chemical free products in the city so they decided to bring the organic produce from their village in Charsadda. What are all the things available at Grans? There is the Grans Desi Gurr. It is chemical free which is great because it is quite difficult to find chemical free gurr in the city. Since it’s free of chemicals, it is of a darker colour as opposed to white. It costs PKR 200 per 0.5 kg. This Gurr is also available in a crushed form which is the Grans Shakkar. This is for PKR 250 per 0.5 kg. There is a special Nutty Gurr available too which has dry fruits incorporated in it. You can also get the best Desi Ghee from Grans. To order it, you need to pre book it since it is homemade and comes from the Swat region. Apart from Gurr and Shakkar, there is a special Peshawari Qehwa that is not found anywhere else in the market. It costs PKR 600 for 0.5 kg. This Qehwa is originally from Brazil, but the reason why it’s called Peshawari Qehwa is because it is widely consumed in that reason. We know how difficult it is to find pure honey, but not anymore. Grans has made our life easier by bringing us the purest honey straight from the Swat region. This is the wild small be Baeri Honey that you won’t find anywhere else in the market. It is available for PKR 1250 per 0.5 kg. Another product available at Grans is the Grans Maize Flour from Swat region. This is super healthy so you better order it ASAP if you are a health junkie. 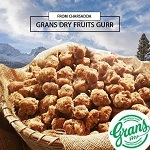 If you want all the healthy and delicious goodies from Grans, then you can order them from Cheetay. So what are you waiting for? Just visit Cheetay’s website or download the Cheetay app and wait while the Cheetah delivers you the best healthy food items in Lahore.